The day after Thanksgiving is traditionally our “get-the-heck-outta-Dodge” day. We’ve tried shopping on Black Friday, but neither Don nor I like crowds and the more commercial it becomes, the further from the madness we want to be. We cut our Christmas tree on Black Friday. 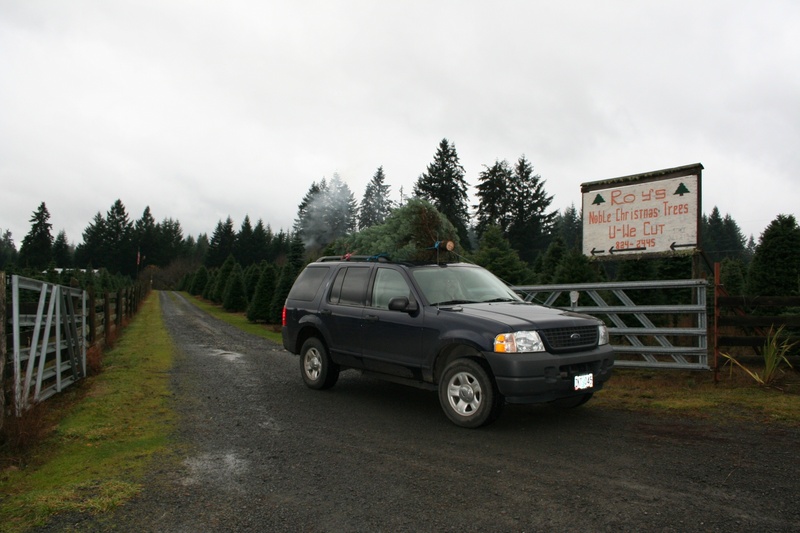 Traditionally, we go up into the National Forest to pick out a wild noble fir, but there are those odd winters when the snow level drops to 2500′ and getting up to 5,000′ is not going to happen. Roads are closed. That leaves tree lots and U-Cut places. And we like wild Noble fir trees. Charlie Brown trees. The majority of U-Cut places grow clone trees that look like little pine incense cones. We’ve stumbled onto a few U-Cut places where we’ve lucked out, and the best one was a place we found the year Sam & Arwen got married. If only we could remember the name of the U-Cut and what road it was on. Don and I searched the Internet for local U-Cut places (this is Christmas Tree country and there are plenty to choose from), but nothing sounded quite right. There was one hopeful in Colton, but when we tried the call ahead number, no one answered. Undeterred, we decided to drive out and look for it. The name of the place was some guy’s first name and he was a really nice laid-back guy who grew laid-back trees. And it was located out by Colton. The amazing part to this tale is that we drove right to it. Roy has been doing this for 18 years but the sign says “Since July 21, 1966”. You drive down in to the place and Roy might be at the house or down at the portable sawmill. He points you in the right direction, and when you’ve picked out a tree, he will come out and cut it down for you. We’ve never paid more than $20 for a Noble at Roy’s. We stood around and visited before leaving, mentioning to Roy that we couldn’t find him on the Internet. Turns out, he’s looked into web-hosting, was over-whelmed at the cost, and left it there. But he told us to tell our friends about his business. So I am telling my friends. 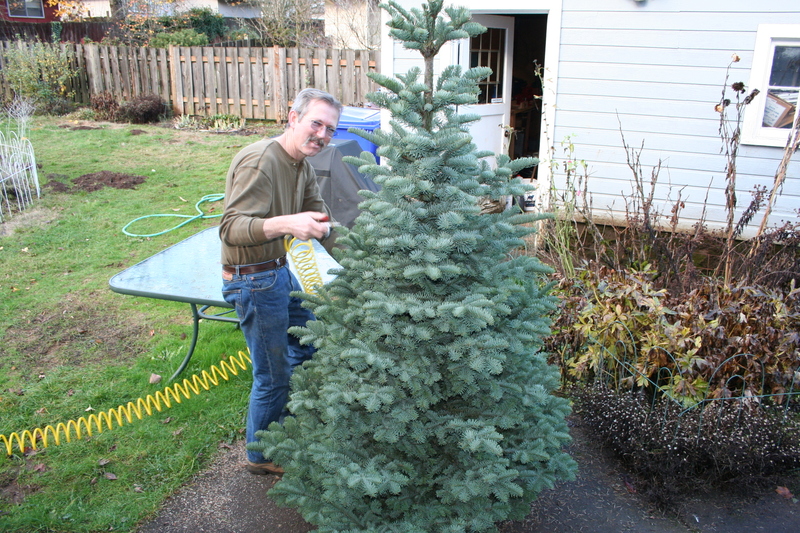 We loaded the tree onto the Explorer and brought it home, where Don used the air compressor to blow out the dead needles and what not from the center of the tree. 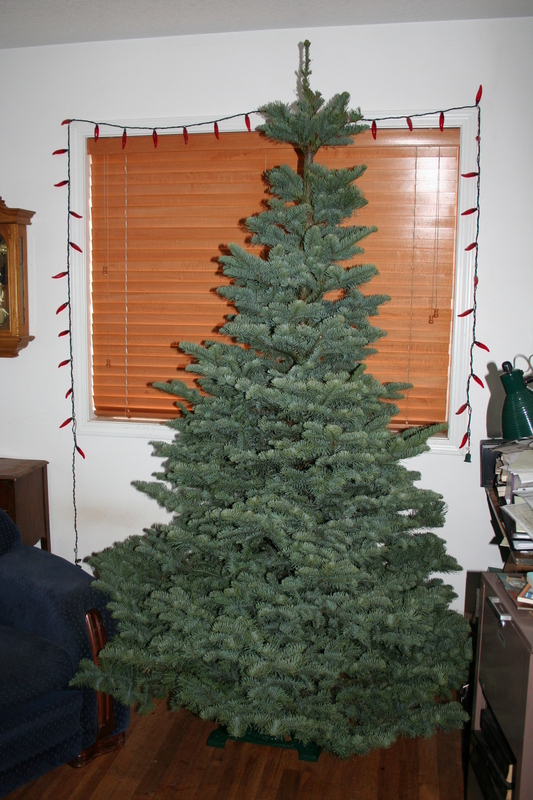 A Just Perfect Noble fir awaiting decorations. $20. Fresh cut, in a stand full of sugar water. It will still be fresh when we take it down in January. Want a tree like this? Or another sort: Doug fir? Grand fir? Do you live locally around the Portland Metro area? Try Roy’s U-Cut. 503-824-2445. 28643 Baurer Road. Take S. Beavercreek Road out of Oregon City to the Clarkes Intersection and turn east onto Unger. Four miles and south onto Baurer Road one mile. There are hand-painted signs along the way. Roy is a very nice man. You’ll be glad you went. I hope your back heals up quickly. It’s so rotten having back pain. PLUS…met a nice lady in the process. Beautiful! What a great way to spend the day! I’ve been having back pain again for the last 5 days. Aren’t we pathetic? Your tree is so nice…it’s going to look great when it’s decorated! I’m sending you a new ornament this year, so watch for it! Nevermind just realized its 30 miles from me! Can’t go that far for a tree. I’m glad… I confess I don’t have Roy’s address. I could drive right to it, but remember the name of the road??? I think I’ll spend the day researching it, though, so I can add it to this post anyway. Have fun getting a tree!